Yeah, I was torn between the SU-27UB and the SU-30MK. I really like the looks of the UB, but the SU-30 has very similar looks and I like the squared off 90 deg vertical stabilizers. Looking forward to progress on this beast. 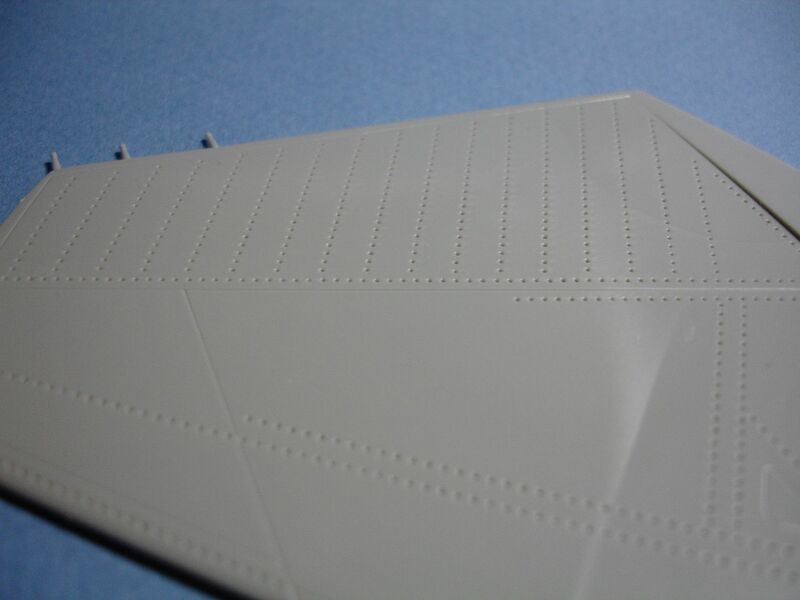 You ARE correct though...............I just got the box for the SU-30MKK; BAR NONE THE BIGGEST BOX AND MODEL IVE SEEN IN PERSON! Depending on how the voting goes, we might be able to put these giants in a "From Russia with Love" group build. Those both look like amazing camo options, but I'd like to throw my vote in for the yellow primer option. Just really different. 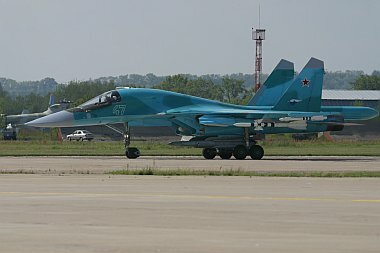 I'm all for a group build, especially if we can get some other people in with Flankers, maybe even trick someone into scratch-building an Su-33 conversion. "I'm all for a group build, especially if we can get some other people in with Flankers, maybe even trick someone into scratch-building an Su-33 conversion." Come on Harv, you know you want to join in. 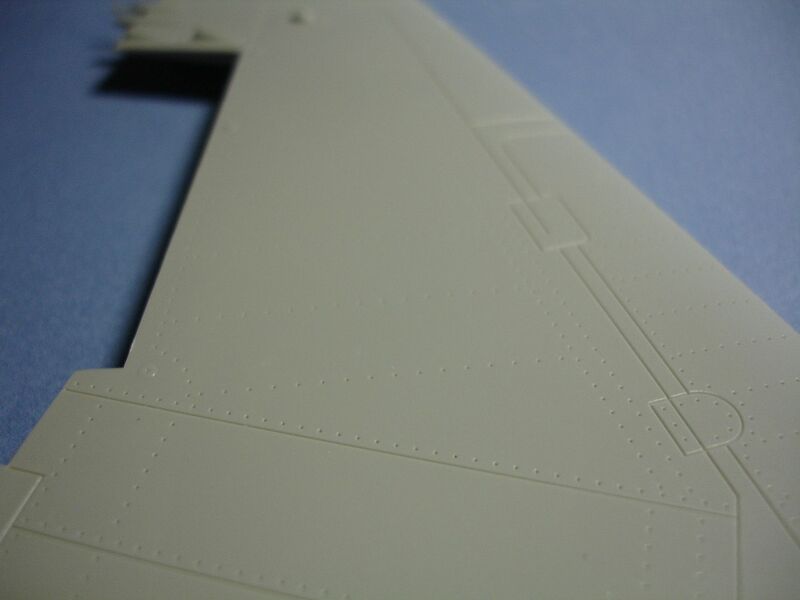 You already have the kit, maybe we can convince the mods to give us a group build for the Flankers. What's one more model in the WIP pile. 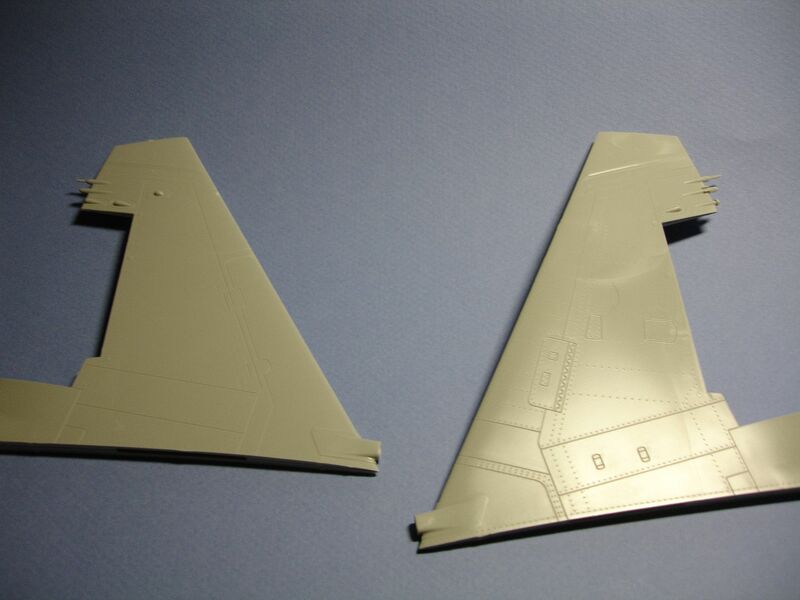 Hey guys, no pictures this time, hopefully soon, but I did just put in an order for the Eduard interior set for the Su-27UB from Sprue Brothers, hopefully should be here within a week. Going to do an oil wash, some pigments, and some chipping on the cockpit tonight, will hopefully post those pictures soon. Glad everyone is so interested in this project. Nice work Mike. Ilove the idea of a split colour scheme, it should look very interesting. This is one kit I need to buy in the future as it have so many AM and converion possibilities! Thanks Derek. It's Matt though by the way. Well, if we get the group build approved, you should join in. Maybe you could try and pull a conversion for an Su-33, then we'd have a UB, an Su-30MMK, and an Su-33 going all at the same time. Sorry I got your name wrong Matt (I have asolutely no idea where Mike came from?). Your model is looking great, and as I do not know a great deal about modern Soviet aircraft, I shall watch your build with interest. As always, I need to get my hands on a kit and reference material for these things, but all of the variants you mentioned are certainly achieveable as far as conversions go...My favourite would be the Su 32FN/34 Fullback! Well, Mike's my dad's name, but I have no way how you would know that. Thanks, I will try and update this regularly as the build goes along. Now that the Eduard set has been ordered, and the Aires wheel wells should be ordered soon, along with the Linden Hill decals for the Ukranian splinter. I wouldn't mind seeing someone tackle the Fullback conversion, or an Su-33. Or maybe Trumpeter will grace us with one at some point in the future. ...My favourite would be the Su 32FN/34 Fullback! I wouldn't mind seeing someone tackle the Fullback conversion, or an Su-33. Or maybe Trumpeter will grace us with one at some point in the future. Ill be following along with interest Matt while you work on this one. It looks like a nice kit. Thanks Brian. It's actually a pretty darn nice kit, so I hope I can do it justice. I sure wouldn't mind seeing a Fullback kit come out, or a 1/32 Fencer... Either of the side-by-side Soviet attackers. Hey all. Here's a quick update for you. 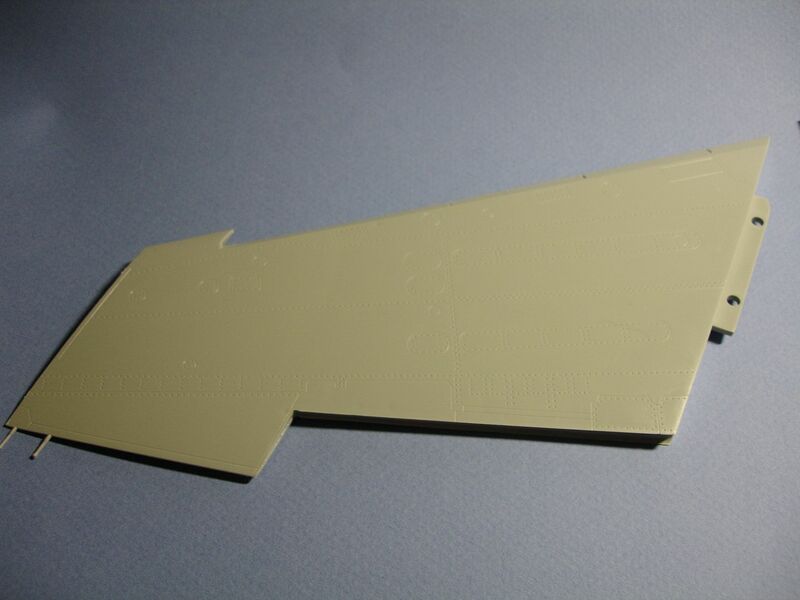 While waiting for the etch set to arrive for the interior, I've turned my attention to exterior work, and most of that has been gluing in the inserts over the course of the upper fuselage, and gluing together all of the empennage parts. So far, everything has been a relatively perfect fit, the only filler needed was on the gun bay cover, which was just a little bit small to fit it's place closed. I'm doing both the gun bay and airbrake closed, not only to make my life easier, but always to preserve most of the lines of the plane, since the canopy will be open. Anyway, enough of my ramblings, here are the photos. 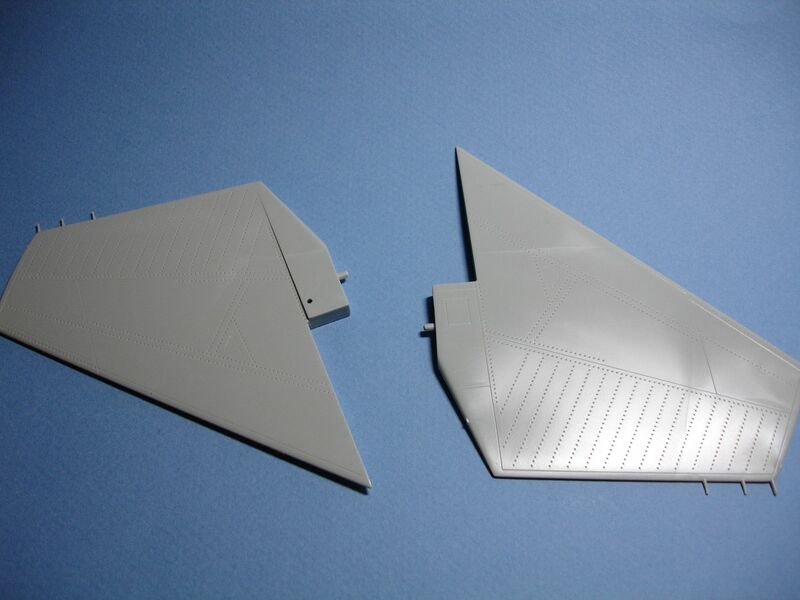 Here are the very large tail segments, you can also see the very nice surface detail on them. I'm one of those people that actually likes the rivets, makes weathering a lot more fun, but that's just my opinion. And here are the wings. You know, for a plane of the Flanker's size, it's got kind of small wings. At least I won't need a super side place to fit this one once it's done. The more observant viewer will probably have noticed that I did not follow the directions and install the photo-etch hinges. That's just personal preference, I don't really like them, I'll probably either glue everything in a neutral setting, or glue it deflected, without worrying about the hinges. Well everyone, that's all for this update. Thanks very much for following along here, and I hope you're all enjoying what I'm doing. Hope to update again soon, the etch shipped this morning. Funny looks like the same contents of my box! I am not usually a big fan (but not a hater of them either) of the Trumpy rivets, but I think your right though, for whatever reason, in this case the rivets really look great, and lend themselves well to that Soviet "rough and raw" kind of look that most of their fighters seem to have. I think your right as well on the weathering thing. I think a coat of fine primer then paint, will lend itself well in the end to washes and what not. Cheers and keep the pics comin! Yeah, Im hoping the Soviet GB gets approved as well. I think the main differences between the 27UB and the 30MK are the nose gear (MK has duel and UB has single) the vertical fins (UB has smaller fins angled at the top and MK has larger fins that are horizontal at the top) and some differences in the windscreen and placement of the offset IRST ball. There may be other differences, but the front office(s) seem to be very similar. Oh, wasn't quite sure on the differences. All I know about the differences are from what I learned from the Eduard website, which has the different cockpit for the Su-30 over the Su-27. If the group build gets approved, you going to join in with me? Get a few Flankers going on the boards at once? I guess I'll have to pause on mine so I don't go too far and break the GB rules.